“FINAL HARBOR” By Harry Homewood. 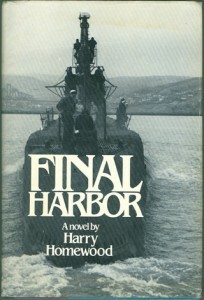 (Fiction) Author Homewood made eleven patrols in American subs during World War II. Author of “O God Of Battles” and “Silent Sea.” Homewood has written one of the best Word War II submarine novels ever published. In this book the fictional USS Mako roamed the Pacific on a mission to seek-out and destroy the invincible ships of the powerful Imperial Japanese Navy. Here is the story of the submarine and the men who pitted their lives against impossible odds in the most dangerous branch of the American armed services. Very popular and difficult to find. 1980 Hardback edition with dust jacket. 372 pages, no photos, maps or index.